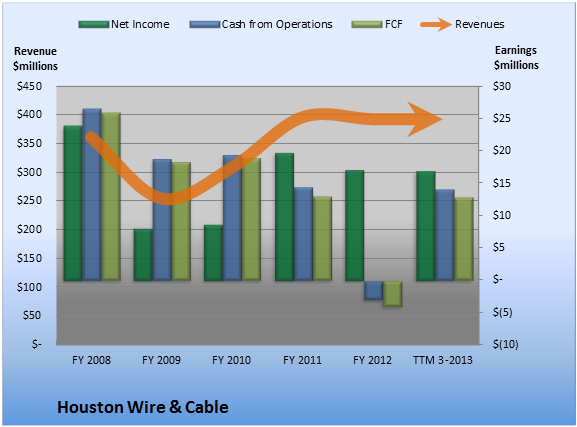 Over the past 12 months, Houston Wire & Cable generated $12.8 million cash while it booked net income of $16.9 million. That means it turned 3.3% of its revenue into FCF. That sounds OK. However, FCF is less than net income. Ideally, we'd like to see the opposite. 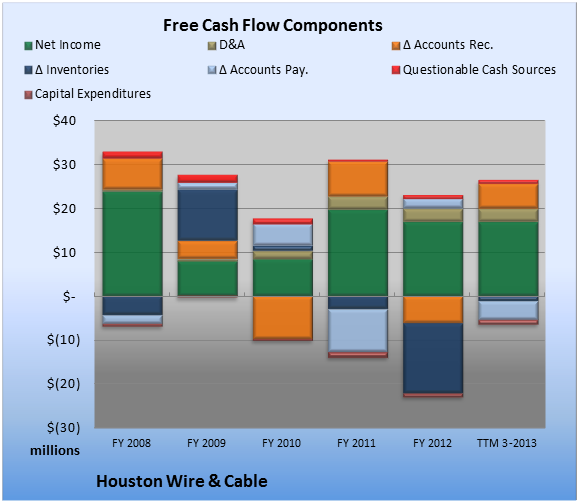 With questionable cash flows amounting to only 6.2% of operating cash flow, Houston Wire & Cable's cash flows look clean. Within the questionable cash flow figure plotted in the TTM period above, changes in taxes payable provided the biggest boost, at 11.4% of cash flow from operations. Overall, the biggest drag on FCF came from changes in accounts payable, which represented 30.8% of cash from operations.